Save up to 40% off on Go Direct Online Store Super Sale, 20% off storewide! • Go Direct Online Store Super SALE Is Back! Go Direct Online Store’s Year End Super Sale Is Back! 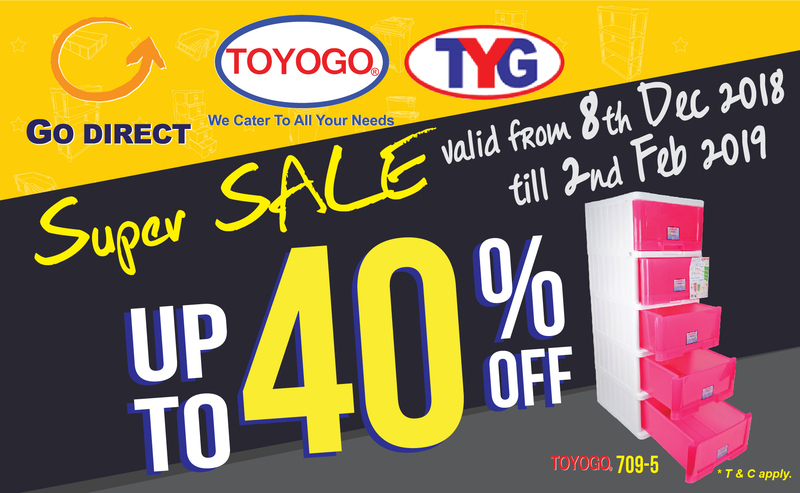 Kickstart your 2019 with crazy deals and discounts on high quality genuine TOYOGO and CLOVER plastic products. Everything from storage containers, drawers, furniture to industrial products, all on sale! Apart from the usual 20% off all items (Yes, ALL ITEMS), selected items are also entitled to discounts of up to 40% off! With over 500 items to choose from, this is the best time to shop for high quality products on Go Direct Online Store! Promotion valid from 8th December 2018 – 2nd February 2019, 11:59PM. Promotion valid on purchases made on Go Direct Online Store (www.godirect.com.my) only. Promotion is non-transferable or redeemable for cash or credit. Selected items that are entitled up to 40% discount, and they are not entitled for additional 20% discount. Prices shown Go Direct Online Store (www.godirect.com.my) does not include shipping charges and 15% discount. Total amount (including Shipping charges & discount) will reflect during checkout. Prices shown in-store includes 6% GST & 15% discount. Minimum order amount online still remains at RM60. Discount only applies to product and cannot be applied on shipping charges. Colour of goods are assorted, depends on stock availability. This promotion cannot be applied to other on-going promotions. Orders placed online will be processed & shipped next working day (exclude Saturday, Sunday & Public Holiday) if in stock. Go Direct Online Store reserves the right to cancel or modify any order, as well as revoke the use of discount for any reason without notice, if found that any offer terms are violated. Go Direct Online Store reserves the right to change these terms & conditions or modify and cancel any promotions without notice.